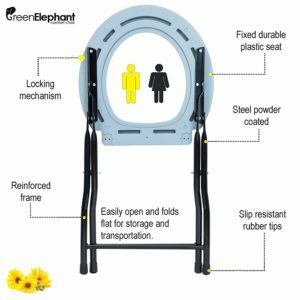 The Green Elephant Folding Toilet Seat has been designed to be portable for outdoor use. A toilet bag fits neatly around the seat to catch waste safely and conveniently. The seat is an off-white color and the stand underneath is black steel. The frame is solid and durable and made to be used with 8 gallon waste bags. It can be used by any age range but you should be warned that it does not come with a back, so you may want to place it against a tree. This portable toilet seat folds down for easy storage and can be easily kept inside a camper or tent while not being used. It makes answering the call of nature while you are in nature easy. This product is of particular use to those with children who are just finished potty training. We all know accidents can happen but when you have the Green Elephant Folding Commode to hand the results are a lot less embarrassing! This model can take up to 350 lbs of weight and is short and sturdy. High weight bearing capacity at 350 lbs. Short, sturdy, built to last and welded for extra strength. Works with disposable bags of any variety. Perfect for hunting, camping, fishing, trucking and traveling with young kids. Cheap and affordable price for a high quality item. 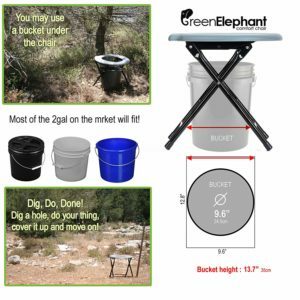 The Green Elephant Commode is the perfect camping toilet. If you have ever been out in the wilderness and desperate then your opinion on this should be the same as ours. This portable toilet seat sports a stand that is stable and sturdy, but best of all it can be used anywhere… even behind a bush at the side of the road. It is suitable for all ages but brilliant for those with young children and a long journey ahead. It is lightweight and folds up into a surprisingly compact and easy to carry bundle. It is not too high to help with stability. 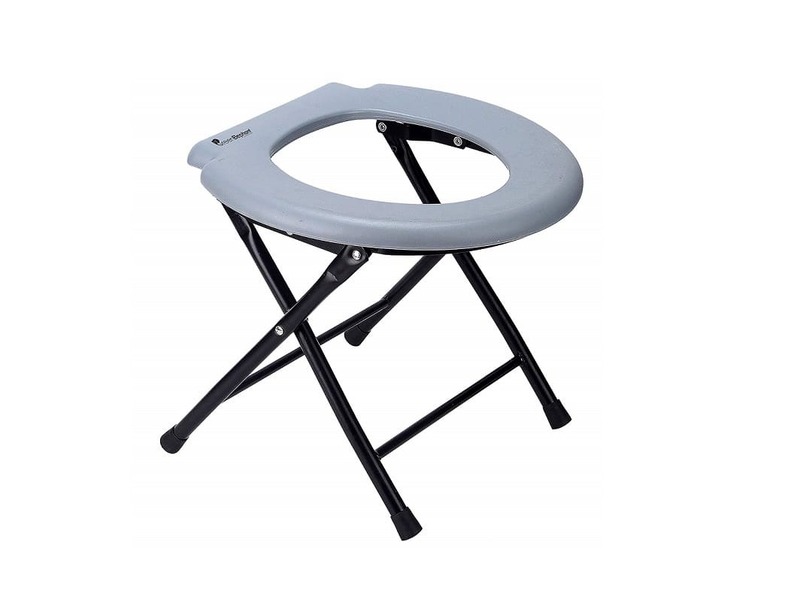 This toilet seat is suitable for camping, fishing, hunting, trucking, road trips – anywhere you need it. We love the versatility of it and the fact that it caters to a basic human function. Furthermore it is highly durable and welded well into place. The support bars connecting the legs provide extra stability even on a slippery surface. Those who are uncomfortable and worry about the bag leaking,may buy specialized bags to make the situation secure… it really does everything you need it to. Verified purchasers of the product love the longevity of it and some have updated after months of use to say it is still going strong. They express surprise that something so lightweight could be so strong, and thoroughly recommend it as a portable toilet seat of choice. The folding mechanism is smooth and secures into place when locked and the bags are easy to use. The whole product is reported to be strong, stable and easy to use overall… and we can’t help but agree. As ever there are the con’s to take into consideration, so let’s take a closer look at those. It might sink in to unsteady or infirm ground. It is short, which helps with stability however may hinder those with sore knee joints. It cannot work with a very big buckets underneath and you need to use specialized bags for an optimal experience. This is not a flushing toilet system. The specialized bags are not child-friendly and will require adult supervision. We honestly struggled to find con’s about the Green Elephant Portable Commode. One unhappy customer did complain that the toilet seat would sink into the ground if placed on a swampy or mossy surface – but we thought that was just a matter of common sense. Some others disliked that they couldn’t place a 5 gallon bucket underneath it because of the reinforcing on the legs, but that is why the product comes with bags. Also, a 2 gallon bucket is recommended as per the product description. This is not a tall toilet, so if you have issues getting up and down it might not be the best option. That being said; it is definitely better than pooping on the ground. If you do choose to use regular bags with this toilet then there is a chance of leakage so you do need to stick to the specialized ones. This will see ongoing revenue to the company and is a good move on their part; but it also means the bags need to be kept away from small children. They have no air holes like other bags do and some of them contain chemicals. There is also the fact that this is a no-flush toilet seat. Your waste is caught in the bag and can begin to smell if you don’t change it. We don’t know how anyone would be able to carry around a flushing toilet though so we are happy that it does the job intended to a suitable level. It is sturdy and strong and won’t see you caught out on the road, but if you place it on soggy ground expect to get your ankles wet. This is a well priced portable toilet seat that makes the call of nature on the move easy as pie. Firstly, it saves you having to go in the great outdoors in discomfort. Secondly it helps you keep young children dry on the road and lastly, makes a suitable substitute for a real toilet on long journeys. Furthermore it is sturdy and well built with that lightweight steel welded frame. It can take a lot more weight than you would expect and folds away neatly for smooth storage. Despite looking we couldn’t find a single report of anyone falling off of one. If you are looking for a reliable portable commode that is built to last then this is an option that should not be ignored. Check out the current price on Amazon here.